Stringent regulations predominantly in developed countries that monitor vehicular emissions to be within permissible limits is having a positive impact on the global aftermarket fuel additives market. For instance, in the U.S., the Environment Protection Agency has enforced regulations for reducing vehicular norms and to improve the efficiency of prevalent fuels. This accounts for significant demand for aftermarket products in the U.S.
Aftermarket fuel additives offer a number of advantages which include performance of gasoline and diesel fuel in vehicles and to address vehicular issues pertaining to engine performance, lost fuel economy, poor drivability, and excessive emissions. Apart from this, aftermarket fuel additives are also used for preemptive maintenance of components in vehicles, which helps to enhance overall efficiency. Proving to be a roadblock to the growth of global aftermarket fuel additives market are low awareness about aftermarket products among consumers and non-availability of aftermarket products as a retail product in developing countries. As per a report by Transparency Market Research, the global aftermarket fuel additives market is poised to expand at a CAGR of 7.2% for the forecast period between 2017 and 2025. If the figure holds true, the global aftermarket fuel additives market will become worth US$1,167.9 mn by the end of 2025 from its evaluated worth of US$628.64 mn in 2016. The report studies the global aftermarket fuel additives market on the basis of product type, fuel type, end-user, and geography. The segments of the global aftermarket fuel additives market depending upon product are octane booster, cetane improver, corrosion inhibitor, antioxidants, deposit control, cold flow improver, combustion improver, anti-icing, dehazer/demulsifier, biocide, and others. Amongst these, deposit control is employed the most as it unclogs deposits from injector nozzle that affects engine performance. On the basis of fuel type, the report segregates the global aftermarket fuel additives market into gasoline, diesel, and others. In terms of end-user, the segments into which the global aftermarket fuel additives market is divided in this report are automotive, oil and gas, and others. The segment of automotive is further sub-segmented into passenger vehicles, light commercial vehicles, and heavy commercial vehicles. Geography-wise, the global aftermarket fuel additives market is studied across North America, Latin America, Europe, Asia Pacific, and the Middle East and Africa. Vis-à-vis revenue, North America led the global aftermarket fuel additives market in 2016, followed by Europe. The two regions collectively held more than 50% of the overall market in terms of revenue in the same year. However, North America and Europe are expected to display declined share in the market over the forecast period. Asia Pacific, however, is expected to surpass in terms of growth rate between 2017 and 2025. Expansion of the Asia Pacific aftermarket fuel additives market is owing to economic development and increasing enforcement of norms for reducing vehicular emissions and to increase fuel efficiency in several countries in the region. Latin America and the Middle East and Africa are relatively small markets for aftermarket fuel additives. However, the demand for aftermarket fuel additives is expected to rise in these regions in the upcoming years. These regions exhibit potential for the growth of the aftermarket fuel additives market due to the expansion of the automotive industry and rising opportunities in the oil and gas industry. Leading players in the global aftermarket fuel additives market include Afton Chemical Corporation, Chevron Corporation, Evonik Company, Lubrizol Corporation, and Total S.A.
Aftermarket fuel additives are employed to improve the performance of gasoline and diesel fuel. They are utilized for preemptive maintenance and also to reduce fuel-related issues. Aftermarket fuel additives help resolve issues such as engine performance, lost fuel economy, poor drivability, and excessive emissions. Aftermarket products are used to clean the components in which the lubricant operates, in order to enhance the performance of the lubricant itself. The report estimates and forecasts the aftermarket fuel additives market on the global and regional levels. The study provides forecast between 2017 and 2025 based on volume (tons) and revenue (US$ Mn) with 2016 as the base year. The report comprises an exhaustive value chain analysis for each of the segments. It provides a comprehensive view of the market. Value chain analysis also offers detailed information about value addition at each stage. The study includes drivers and restraints for the aftermarket fuel additives market along with their impact on demand during the forecast period. The study also provides key market indicators affecting the growth of the market. The report analyzes opportunities in the aftermarket fuel additives market on the global and regional level. Drivers, restraints, and opportunities mentioned in the report are justified through quantitative and qualitative data. These have been verified through primary and secondary resources. Furthermore, the report analyzes substitute analysis of fuel additives and global average price trend analysis. The report includes Porter’s Five Forces Model to determine the degree of competition in the aftermarket fuel additives market. The report comprises a qualitative write-up on market attractiveness analysis, wherein end-users and regions have been analyzed based on attractiveness for each region. Growth rate, market size, raw material availability, profit margin, impact strength, technology, competition, and other factors (such as environmental and legal) have been evaluated in order to derive the general attractiveness of the market. The report comprises price trend analysis for aftermarket fuel additives market between 2017 and 2025. Secondary research sources that were typically referred to include, but were not limited to, OPEC Annual Statistical Bulletin, U.S. Energy Information Administration (EIA), International Energy Agency (IEA), Independent Chemical Information Service (ICIS), Additive Technical Committee (ATC-Europe), European Environment Agency, World Energy Outlook, FuelsEurope, International Maritime Organization (IMO), SAE International, European Automobile Manufacturers' Association (ACEA), U.N. Comtrade, U.S. Department of Transportation, and Department of Transport Statistics, company websites, financial reports, annual reports, investor presentations, broker reports, and SEC filings. Other sources such as internal and external proprietary databases, statistical databases and market reports, news articles, national government documents, and webcasts specific to companies operating in the market have also been referred for the report. Rising demand for aftermarket fuel additives is primarily driven due to the adherence to stringent environmental emission control regulations. Consequently, the aftermarket fuel additive market has expanded at a significant growth rate due to adherence to the various norms and regulations about carbon emission. Aftermarket fuel additives offer a wide range of benefits; however, awareness about them is low. This is primarily due to the utilization of aftermarket fuel additives only in the oil & gas industry, along with the lack of awareness of aftermarket fuel additives among consumers. Moreover, the non-availability of aftermarket fuel additives as a retail product in developing and under-developed countries, further hampers its market. The implementation of the Renewable Energy Directive (RED), which requires 10% of energy used in transport to be from renewable sources by 2020, and secondly, the Fuel Quality Directive (FQD) requires fuel suppliers to reduce the greenhouse gas intensity of energy supplied for road transport by 6% by 2020, supported the usage of aftermarket fuel additives. The chemical industry’s competitive landscape is changing rapidly. The discovery of shale gas in the U.S. is driving the supply base of the chemical industry towards the West. Meanwhile, the demand base of the chemical industry continues to move to emerging markets, though at volatile growth rates which means the most attractive markets are changing from one year to the next. This lack of visibility is increasing the risk of supply chain disruption, which is anticipated to dramatically impact the market. Therefore, manufacturers are focusing on key markets to fuel their growth. This is anticipated to have a considerable impact on the market for aftermarket fuel additives during the forecast period. 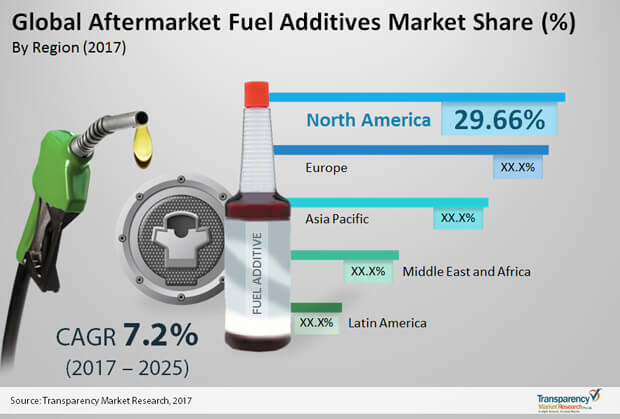 The study provides a comprehensive view of the aftermarket fuel additives market by dividing it into product, fuel type, end-user industry, and geography segments. The applications are segmented into octane booster, cetane improver, corrosion inhibitor, antioxidants, deposit control, cold flow improver, combustion improver, anti-icing, dehazer/demulsifier, biocide, and others. Fuel types have been segmented into gasoline, diesel, and others. End-user industries have been divided into automotive (further divided into passenger vehicles, light commercial vehicles, and heavy commercial vehicles), oil & gas, and others. These segments have been analyzed based on historic, present, and future trends. Regional segmentation includes the current and forecast consumption of aftermarket fuel additives in North America, Latin America, Europe, Asia Pacific, and Middle East & Africa (MEA). Market segmentation includes demand for consumption in all the regions individually. The report covers detailed competitive outlook that includes market share and profiles of key players operating in the global market. Key players profiled in the report Afton Chemical Corporation, Lubrizol Corporation, Chevron Corporation, Total S.A., and Evonik. Company profiles include attributes such as company overview, number of employees, brand overview, key competitors, business overview, business strategies, recent/key developments, acquisitions, and financial overview (wherever applicable).